Skyrmions are nanoscale whirls or vortices of magnetic poles that form lattices within a magnetic material, a type of quasiparticle that can zip across the material, pushed by electrical current. "In order to be really useful in a device, these magnetic vortices need to be able to exist without the 'help' of an external magnetic field," said Lin Zhou, a scientist in the Ames Laboratory's Division of Materials Sciences and Engineering. 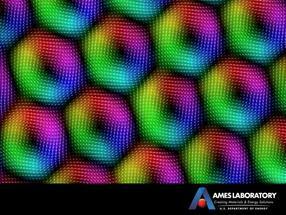 Ames Lab scientists with external collaborators were able to establish a skyrmion lattice in a sample through exposure to magnetic fields and supercooling with liquid nitrogen. With a high resolution microscopy method called Lorentz transmission electron microscopy (L-TEM), the team was able to observe the skyrmion lattice in zero magnetic field, and then observe the decay of the skyrmions as the temperature warmed. This direct observation yielded critical new information about how skyrmions behave and how they revert back to a 'normal' (what scientists call metastable) magnetic state. "We've stabilized these skyrmions without a magnetic field, and our microscopy techniques allowed us to really see how the vortices change over time, temperature, and magnetic field; we think it provides a very solid foundation for theorists to better understand this phenomenon," Zhou said.